There is a simple truth that connects every person in every city, town and village across America: They want a safe, affordable place to call home. A place to raise their families, enjoy meals with friends and rest their heads at night. But for too many people across the country, that vision of home is not accessible, affordable, or in many cases, available. That is why the National League of Cities (NLC) has made it a priority to support local leaders’ efforts to identify and implement local housing solutions. Local Tools to Address Housing Affordability: A State-by-State Analysis is an important part of that work. Developed and published in collaboration with the 49 state municipal leagues, the report provides an in-depth look at the interplay of state policies and local housing markets. While no two communities face the exact same set of challenges, we can see the varied impact of policies through this research. 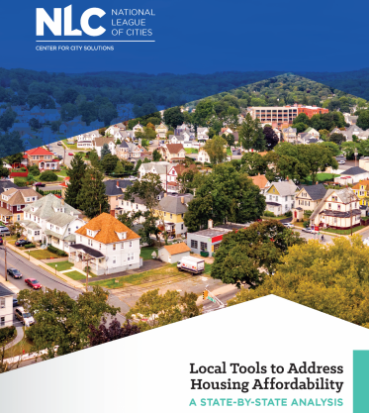 This report complements NLC’s broad focus on housing, which includes the development of resources and best practices, on-the-ground technical assistance, and advocacy at the federal level. In late 2018, NLC further expanded its housing work through the creation of a national housing task force comprised of mayors and councilmembers from 20 states as well as two state municipal league leaders. The task force will publish recommendations to help communities respond to the growing challenges of housing availability, affordability, investment and quality in June 2019. Local leaders are unified in their call to improve housing opportunities for all — because every person not only wants a place to call home, they deserve it.